I hope you and yours will be able to enjoy the arrival of the 20th Century tonight. 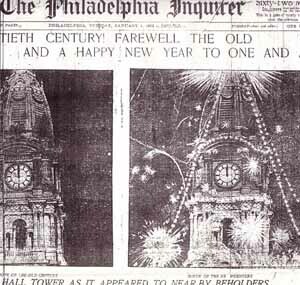 Philadelphia is going to outdo herself in celebrating the event by the display of electricity and fire works and I have no doubt Middletown will do her best to keep up the show. This has been another damp day and may rain to-night and spoil the celebration – but – I hope not for the sake of those who have been planning to enjoy the pleasure of seeing the first new year of the new century. I would see it from the 3rd story window if I could climb, but I am still in the 2nd story and cannot go up or down – if I attempted to climb up there is no doubt that I would soon get down, but the result might not be pleasant. Stephen Jay Gould Questioning the Millennium, Harmony Books 1997 Note that the arrival was marked not on Dec 31 1899 but Dec 31 1900. https://www.amazon.com/Questioning-Millennium-Rationalists-Precisely-Arbitrary/dp/0609605410 I was fortunate to hear Stephen Jay Gould talk about this book at Brookline Booksmith.